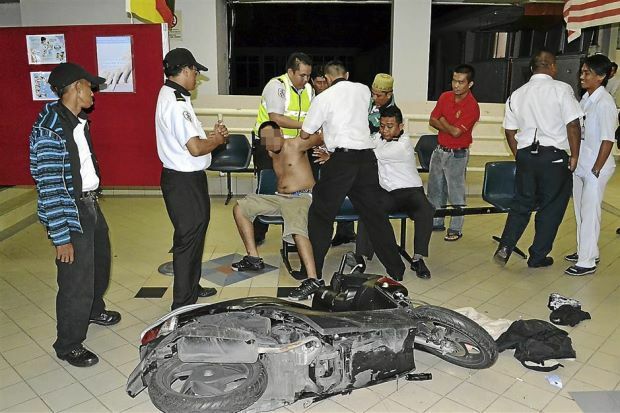 An intoxicated rider from Petra Jaya nearly rammed a patient lying on a stretcher on his way to a ward in Sarawak General Hospital. The rider, 23, resisted and spat at a security guard when he was apprehended around 11pm on Sunday. Before his arrest, the man was riding along the corridor of the hospital and nearly knocking a patient who was being stretchered into a ward. The rider managed to avoid the stretcher but fell from his scooter near the elevator. Security guards quickly held him and alerted the police. He was soon brought to Sungai Maong police station where he was questioned and locked up.